FREDERICTON (U SPORTS) – Cam Braes (Shawnigan Lake, B.C.) scored four goals and Mark Simpson (Fredericton, N.B.) added another as the UNB Varsity Reds defeated the Saskatchewan Huskies 5-3 to win the 2017 U SPORTS Cavendish Farms University Cup. It was the second straight national title for the Varsity Reds, and seventh in the school's history. Braes opened the scoring at just over four minutes in, on a goal-mouth scramble. Huskies forward Connor Gay (Saskatoon, Sask.) 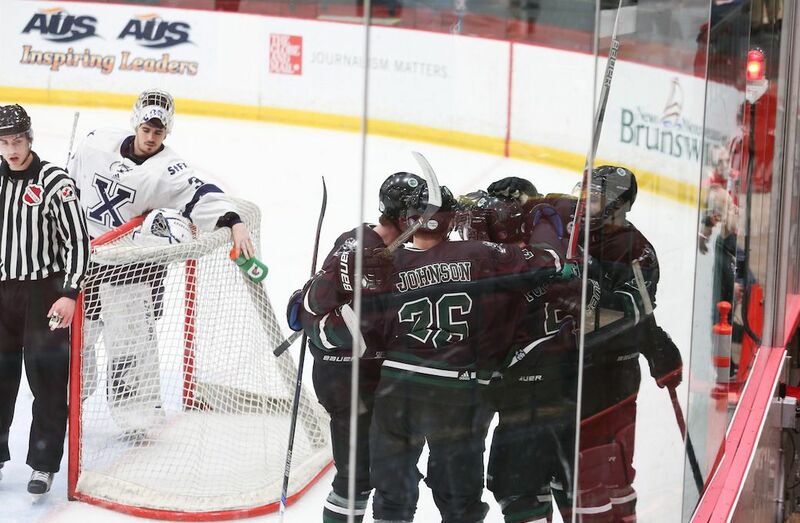 tied the game at 10:47 with a shot that bounced off the shoulder of UNB goalie Etienne Marcoux (Terrebonne, Que.) and popped into the net. 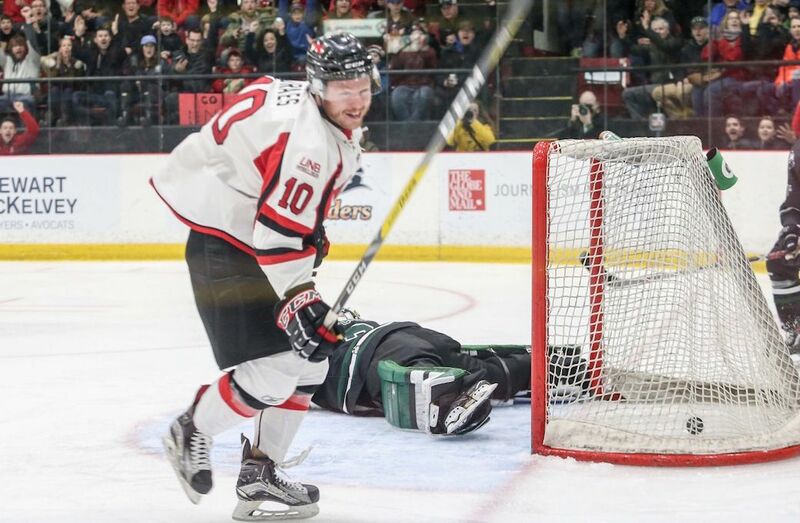 Mark Simpson restored UNB's lead when he shoveled the puck past Jordon Cooke (Leduc, Alta.) at 12:19. In the second period, Braes tallied his second at 3:17, on a nice tic-tac-toe passing play, then added another on the power play three minutes later where he needed two shots on net from close range to beat Cooke. Jordan Fransoo (North Battleford, Sask.) then brought the game within two for the Huskies, scoring at 8:25. In the third, Saskatchewan cut the deficit to one, on Kohl Bauml's (Saskatoon, Sask..) marker at 15:43. Braes then added his fourth of the game, with a back-door power play goal at 9:50. The Varsity Reds outshot the Huskies 36-21 en route to the championship victory. For the veteran Braes, the game was his last in a UNB uniform. "I wanted to leave my legacy on UNB's program. I'm leaving with three titles in five years, and two university degrees," he said. "Every one of the championships was important. The first one was special. I had never won anything big, so it was a good one. The second was important for the program and for us as players. And this time, we are the first UNB team to win championships back-to-back." "I was lucky to play with great linemates tonight," Braes added. "They knew when to give a great feed, and I was the beneficiary of their ability to get me the puck." UNB head coach Gardiner MacDougall had a feeling things might go Braes' way in the championship game. "We are a confident group. The energy in the building really helped us," he said. "We had the lead, gave up a goal, then got the lead back, and it was about then I thought the game was ours. We had a dominant second period. And to have that fifth goal, scored by a fifth-year guy, well, that was perfect." MacDougall, who is known to be an active recruiter, said he would likely be on the phone again tonight, building for the future. Three players finish wrapped up their careers at UNB - Braes, team captain Cam Critchlow (Summerside, P.E.I.) and Rob Mignardi (Richmond Hill, Ont.). All three captured their second straight national title with the Varsity Reds, who won the 2016 University Cup in Halifax. Philippe Maillet, who had four assists in Sunday's championship game, was named the Most Valuable Player of the University Cup. Marcoux was named top goaltender, while Acadia's Geoff Schemitsch (Thornhill, Ont.) and Saskatchewan's Jesse Forsberg (Waldheim, Sask.) were selected as the top defencemen. Braes, Maillet and Saskatchewan's Levi Cable (Hudson Bay, Sask.) were named the all-Star forwards.